Mobile Phone Laughter at Laughter Yoga Session. 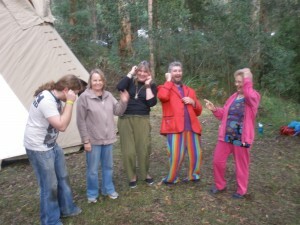 Lynette Mitchell leading the Laughter Yoga sesion at SelbyFest 2011. A small crowd, the festival was beginning and it was a riotous laughter filled group alongside the tipi.